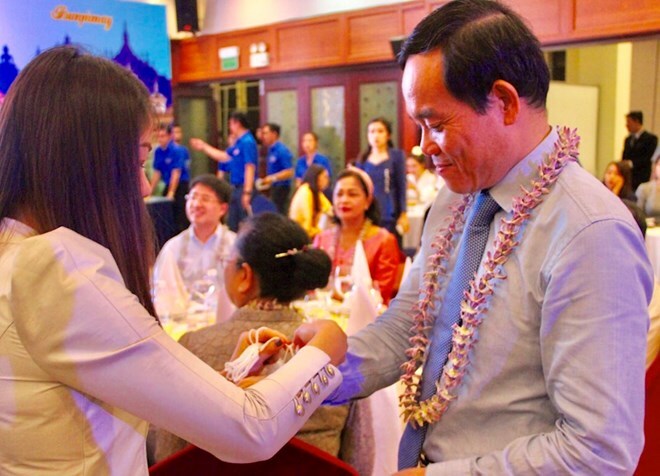 HCM City (VNA) – Permanent Vice Secretary of Ho Chi Minh City’s Party Committee Tran Luu Quang held a meeting on April 10 with Lao and Cambodian students on the occasion of their New Year festival. The New Year festival, called Chol Chnam Thmay in Cambodia and Bunpimay in Laos, takes place in April every year, attracting tourists with traditional culture, a festive atmosphere and water splashing traditions to wash away bad luck and pray for a good new year. Quang extended his wishes for a warm and happy New Year to them. He voiced his belief that they will work for stronger friendship and solidarity among Vietnamese, Lao and Cambodian peoples, thus helping build an ASEAN community of peace, cooperation and development. At the meeting, Lao and Cambodian students presented traditional art performances of their nations. Earlier on April 6-7, the municipal Ho Chi Minh Communist Youth Union organised an exchange programme for the three countries’ students in the southern coastal province of Ba Ria-Vung Tau. The event aimed at helping participants understand more about each country’s culture as well as the friendship and solidarity between the three nations.